In my role as eLearning Integrator at St Andrew’s College, one of my major responsibilities is to provide Professional Development to staff in a wide variety of eLearning, and more general ICT products. In 2015 I ran a series of lunchtime sessions, on a variety of different topics, as well providing individual PD sessions to staff who requested it. Attendance at these sessions was sporadic, with many commenting that the time the sessions ran, Tuesday lunchtime, was not convenient for them. Early in 2016 I put a lot of thought into the best delivery model to follow to ensure that as many staff as possible could access eLearning PD this year. In addition, a clear goal was set, that all secondary staff attend at least one, optional, eLearning PD session during 2016. This PD contact is in addition to the informal eLearning support that I provide to staff on a daily basis. Reflecting on the feedback that the flexibility of timings is important for staff engagement, I decided to embrace an extremely flexible approach to providing Professional Development. The model I decided to follow, in Term 1, was to have a weekly theme(s) for the sessions, and then run the sessions upwards of 10 times during the week. Teachers are busy people. One aspect of eLearning that I am extremely conscious of, is the dangers of exposing teachers, and students, to too many new products. I find that this can lead to a disjointed view of the benefits of such tools, and a general feeling of disengagement with eLearning and a possible perception that it is too hard to get to grips with. With this feeling clearly in mind, I made the decision to only provide professional development for tools that had already been introduced to staff in some capacity. This doesn’t mean that these tools would not be new to some staff, but a significant number of staff would, at the very least, have a basic conceptual understanding of the product. The services I decided to focus on were eTV, Zaption, Office Mix, Moodle, OneNote, and our Appraisal platform; Appraisal Connector. By offering a variety of potential times for staff to attend PD sessions, I was hoping that attendance would improve. The typical week had a mixture of before and after school, lunchtimes and individual period sessions. An example weekly schedule showing the times and location of PD. This information was widely circulated to all staff. In addition, all staff were emailed the full weekly schedule, and in certain weeks, daily email reminders were sent. These daily emails proved particularly effective, and were surprisingly easy to manage by writing them all at the start of the week, and then using the delay delivery function in Outlook. With the aim of all secondary staff to attend at least one optional eLearning PD session during 2016, I was very interested in how they would respond to this new delivery model. During Term 1, 62 different Pd session were run – over a 7 week period. With approximately 90 teaching staff in the secondary school, it was pleasing that, during the term, I had 68 attendees at my sessions, made up of 42 different staff. On reflection, I am satisfied enough with these numbers, as the PD sessions were deliberately marketed as being optional, and they are all in the teacher’s own time. 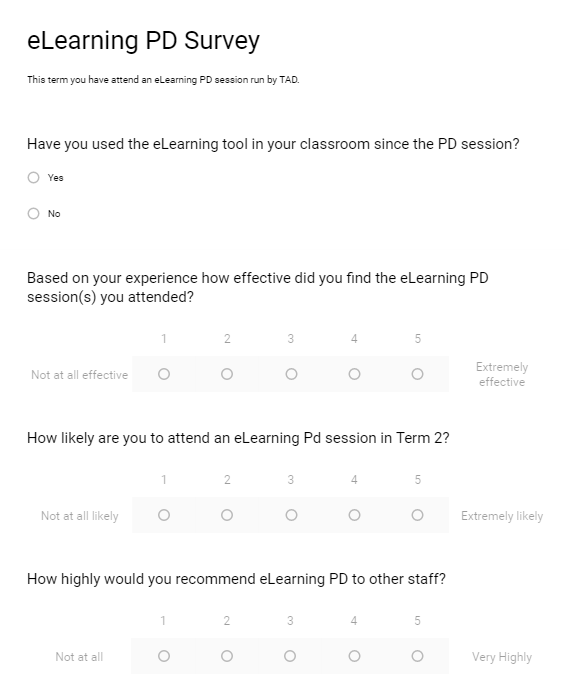 This week, all staff who attended at least one of my sessions were emailed a short survey to fill in. Results are obviously still coming in, but over half of staff have responded. The results are pleasing. 85% of respondents have used the eLearning tool in their classrooms, 90% say that are extremely likely to attend a Term 2 session, and 95% would highly recommend an eLearning PD session to other staff here at St Andrew’s College. I am fully committed to the continued upskilling of staff, and I feel that there is ongoing value in this approach to providing Professional Development. I look forward to connecting with the remaining staff that could not find time to attend a session in Term 1. Possibly think about recording your sessions and uploading to YouTube to allow staff to go over things they may have missed? It can be an effective way to improve staff uptake of the skills you want them to use. Thanks for that – I have thought about doing that in the past – I do make a few how-to videos. I chose not to record PD sessions as they are all different and they address the needs of whoever happens to walk in the door at any one time. Thanks for the suggestion though; worth more thought!